The story, as I remember it, is as follows; soon after I was born, I went, along with my parents and older sister, to visit extended family in the former Yugoslavia. It was right after the war, and I was about one year old. On that trip, I started to learn and speak Serbian, my family’s mother-tongue. Perhaps “remember” is the wrong word here. I remember this visit the same way you might remember posing for a childhood picture, only because you were shown it a thousand times. How I learned (and forgot) Serbian is a story that has been retold about me, and to me, an uncountable number of times. I am told I was a precocious speaker. I am not sure how or why, but evidently I started speaking, with relative fluency, pretty quickly. When we returned to America, I went to the local playground, proud of my newfound language skills and eager to interact with other children. When I started speaking Serbian, the other children laughed as if I were speaking gibberish. I ran away, humiliated. I am told I didn’t speak for six months, and when I eventually did, I only did so in English. I never spoke fluent Serbian again. I was about two and a half. 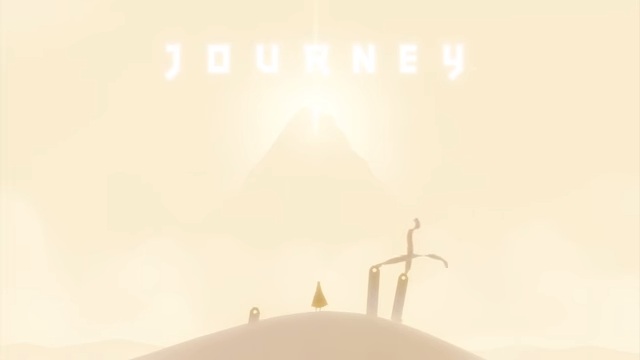 Journey came out almost seven years ago, but I only played it for the first time late last year. When I did, I marveled at its minimalist technical accomplishment and rich, beautiful art direction. 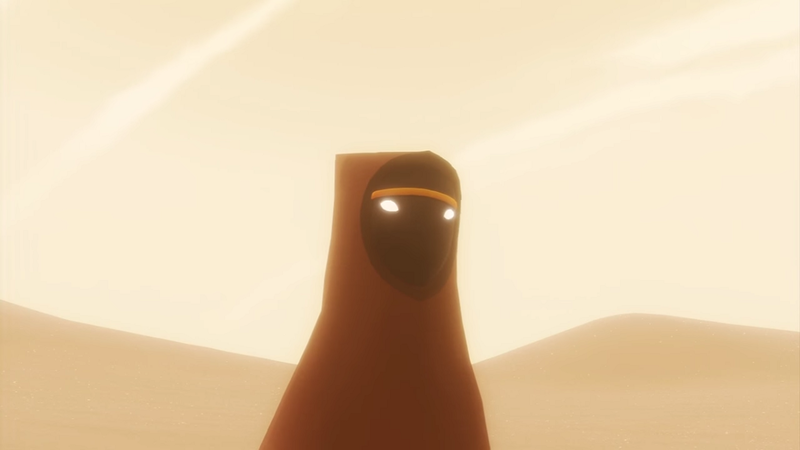 It is in part for these attributes that Journey, almost immediately upon its release, was canonized in gamer culture as proof that video games are an art form. My original approach to engaging with Journey focused on its formal characteristics. The character design is minimal, yet very expressive. The only way players can interact with other players or with the world is to move in it and release a sort of ping that activates features of the environment. When interacting with other players, this auditory beacon can signal discovery of the path forward or other interesting features. Journey has been lauded as a transcendent experience, embodying the inherent togetherness of all human beings. I more or less expected this spiritual revelation to materialize in my first play-through, but if I am being honest, I felt no such thing. The game is beautiful, smartly designed, and a marvelous storytelling accomplishment. But I felt no transcendence. This was, momentarily, profoundly disappointing. But it wasn’t until after my first play-through that I realized maybe my approach was too technical. I was interrogating the work for some insight into language’s role in community and human connection. I realized I was looking for a fix to a personal problem that Journey had highlighted in my own life–a feeling of isolating muteness in the presence of my own family. When you begin Journey, you have no idea why you’ve fallen out of the sky. The opening cinematic depicts a star plummeting into the middle of what appears to be a vast wasteland of dunes. When the camera pans down to the site of the star’s crash landing, you see a cloaked figure stand up in the sand, two legs draped in sandy earth-tones. A face beneath the cloak’s hood reveals two bright eyes on an otherwise featureless, dark, oval face. A distant mountain is your destination, if only by virtue of being the only discernible feature of the landscape to break up the horizon of sand. You might expect this isolation would be broken by the presence of another player. Some other lonely wanderer dropped out of the sky might commiserate with you, and your journey will be a shared one on the long road home. But the language barrier presented by Journey’s silence thwarts this expectation; even when you are matched with a stranger to trek through the desert together, your only mode of communication is to ping a single, euphonious note. You can’t talk with your new partner. Instead, something else happens. 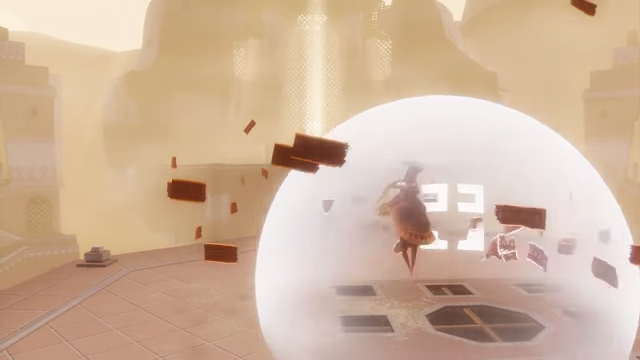 Journey’s mechanics are those of a very rudimentary platformer. Sometimes you have to hunt for a particular feature of the environment that will enable you to progress, and if you are playing with another person, the only way to signal a discovery is to ping that single note. In lieu of verbally describing what you’ve found, you draw your partner over to discover the same feature. Often, these discoveries lead to segments where players can fly with the aid of strange creatures made of cloth and covered in symbols that look like an alien script. In effect, this limits your communication with a partner to an experiential mode. Instead of being able to translate your discoveries through speech, you are simply forced to share the experience in as close to its original, unadulterated form as possible. Togetherness turns out to be more important than communication. These seemingly unintelligible symbols mark creatures or features of the environment that enable you to traverse it. Long, kelp-like ribbons, sometimes as much as 50 feet tall, allow you to levitate. Airborne cloth-creatures carry you through the air like magic carpets. Two exhilarating sequences in the game allow you to slide down extensive slopes of sand, keeping pace with other cloth-creatures that make joyous, dolphin-like noises as they lead you down the slope. Perhaps most importantly, the symbols show you the way to small totems. And these totems, if you sing for them, will teach you their history. Learning Serbian has always been very difficult for me. Repeated efforts would fizzle out after a few hours committed over a week or two. My vocabulary in Serbian has never exceeded 500 words. My running theory for much of my life was that I had internalized that moment of ridicule on the playground as a sort of mental block. Every time I tried to learn Serbian, I perceived that ridicule lurking in my memory. This seemed a fitting explanation for quite a while. But when I began to think about it more rigorously, I had serious doubts. First of all, I have, and had, no conscious memory of that moment. Did I really form such a powerful aversion before the age of three that it effectively impaired my ability to learn this language? Further complicating this idea is that I learned quite a bit of Spanish while in school. I was nearly conversational, and once had ambitions of traveling to Spain and throughout Latin America. Is it really possible that I had some repressed memory of being ostracized that was so powerful and specific that it stopped me from learning Serbian, and only Serbian? A much more sensible explanation, it occurred to me, was a combination of physical exhaustion and perfectionist anxiety. I took on a very large academic load through high school and early university. I averaged less than six hours of sleep on weekdays during the school year, so I probably just didn’t have the energy left over to sustain a side-project as large as learning a language, at least not one for which I wasn’t being graded, like Spanish. But more important than that was the feeling that if I wasn’t going to speak Serbian perfectly, it was best not to make a fool of myself by ever speaking it imperfectly. The predictable result was that I pretty much never spoke it, in spite of the persistent, stinging feeling that I was not a part of my own family. My parents and sister would frequently have conversations in Serbian, a language that my parents are fluent in and my sister is conversational in. They’d sometimes stop, mid-conversation, to fill me in on what they had just been saying. Jokes hurt the most, because the translations were rarely as punchy as the Serbian versions seemed from how hard my family would laugh. A good faith effort to include me in the conversation just seemed to drive home my feeling of being an outsider, both knowing that I wasn’t adopted, and feeling like that was the case. I felt worse when overseas relatives would call. Skype calls would bring me face to face with my grandparents, who spoke virtually no English. My parents would have to translate, and so I felt like a stage prop, on camera more to be seen than heard. These were the moments when I felt the most isolated. I’ve usually imbibed these moments as proof that I don’t belong in my own family, and of course, I’d feel guilty about that. I felt like I was forcing my grandparents to learn English in order to speak to me. I felt like speaking was the only way I could show my cousins and uncles and aunts and grandparents that I loved them, and that I was refusing to do that. You don’t learn the history of Journey’s world the way you’d learn it in a classroom. You don’t learn any dates or names, no series of events, as all the writing is in the same alien glyphs scrawled on the bodies of the game’s creatures. Nonetheless, you do glean some lesson from what you see; the pictures effectively convey a tragic reality, the culmination of which is seen in the ruined world you traverse. A major part of this ruinous environment are massive stone wyrms that glide across the landscape. Dozens of feet long, these giant stone monsters slither through the air in certain areas, shining large spotlights on the ground. These segments of the game are devoid of music, either dead-silent or smothered with the sound of howling wind. The effect is deeply eerie and unnerving; it is immediately clear that these things, whatever they are, are very dangerous. 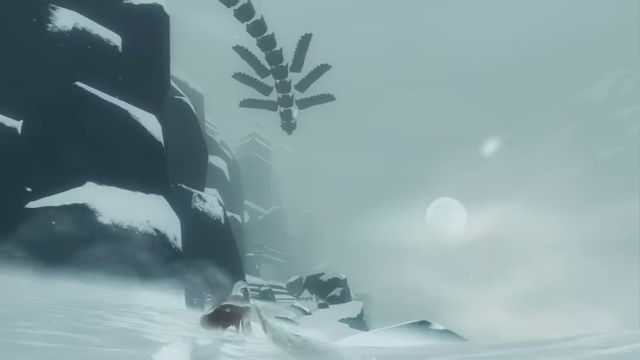 Throughout the game, you wear a scarf covered in the same alien script as the creatures and ruins. When you find small groups of cloth-creatures huddled in pens throughout the landscape, they convene around you and lengthen the scarf. 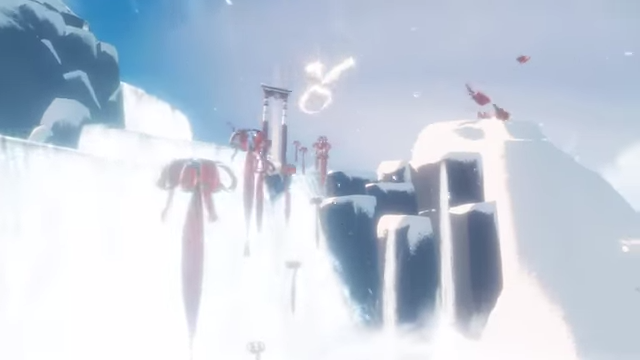 The longer the scarf, the longer you can hover in the air while you jump, and the higher you can ascend. Communion with the beings around you literally enables you to fly. The stone wyrms are the only things in the game that can shorten this scarf. When they see you, they roar and swoop down onto you, shaking the ruins and ripping off a chunk of this scarf. The monsters, in this fashion, tear away the fruits of your union with the environment and cripple your ability to traverse the ruins. The cut-scenes that show you the past of this world depict what appears to be a thriving, architecturally vibrant civilization, calling forward to the evidence you see all around you. 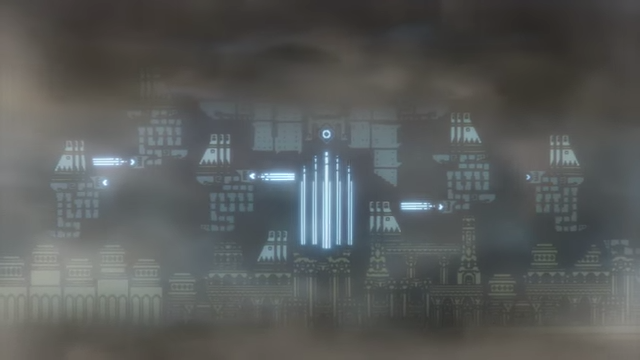 One of the later scenes shows the stone wyrms; they appear to be artificial creations of this past civilization, deployed to wage a war that ultimately ruined the otherwise thriving society. The alien writing and pictorial history is, deliberately, indecipherable. But it conveys an undeniable sense of tragedy, a story of a society ruined by its own commitment to the creation of vast machines of war. Worst of all, while the society withered into the desert, the war machines remain to bedevil wanderers, including fallen stars found out of their element. I didn’t know about the Yugoslav Civil War–that there had even been a war in Eastern Europe in the recent past–until fifth grade. I forget how I learned about it, but the knowledge has become a perdurable element of my personal identity. I have great difficulty trying to study the Yugoslav Civil War, but the assessment I am confident in goes like this; Yugoslavia, a relatively successful state socialist project, suffered from lingering ethno-sectarian tensions going back to the Middle Ages. These sectarian tensions were exploited by outside actors, especially NATO powers, to create a war that allowed Western corporations to loot the country’s most lucrative properties and industries. The region has suffered egregiously high unemployment, low foreign direct investment, and general political stagnation ever since. Most vivid is the story my parents told me about the US Air Force’s 72-day bombing of Sarajevo. My parents had come to the states in order to keep themselves and my then two-year-old sister together (I had not been born yet). When the war broke out, all travel to Yugoslavia was cut off, isolating them from their entire families. Unsure of whether or not their family members were still alive, my parents watched barely-color newsreels of the bombing of my mother’s home city, wondering where in the city they were that day, if the bombs had hit them. There was no way to call and check. My understanding, since the fifth grade, has been that this war isolated me from my family before I was even born. I was born in 1994, while the war was still going on. The story at the beginning of this piece would have taken place in early ’96 to ’97. But by then, even with the family in communication again, my parents had been forced to settle in America. The knowledge of this history has also isolated me from most of the people I grew up around. I am light-skinned and speak English with a native accent, and I grew up within driving distance of the headquarters of Raytheon, CACI, and SAIC. It’s very hard to identify as a typical white American, knowing that so many people I live near likely worked at companies that abetted the bombing of my family. But saying this to the people in my neighborhood, at my school, or at any of the places I worked, is taboo. What I’m left with is that feeling of isolating muteness. I’ve lived most of my life feeling like I got cheated out of the family I might have had. As metaphors go, falling out of the night sky into an empty desert is a good way of describing how displaced and isolated I’ve felt. That mute, lone wanderer isn’t exactly me. But he looks a lot like me, in the right light, at the right angle. The Air Force planes that bombed my grandparents aren’t magical flying golems. But they are the product of a society bent on using mechanized violence to obliterate its rivals, with similarly self-defeating results. They look a lot less sorcerous than stone wyrms, but it’s hard not to see them as a similar byproduct of an analogous society. There are few things that more effectively reduce societies and people to ruins than bombs. Journey does not, however, leave you defeated. Even though you fall into the snow of the mountainside as you climb, freezing and exhausted, the shining entities that have been teaching you the cautionary history of this ruined society uplift you and enable you to fly one more time. I mentioned that this game didn’t produce any kind of uplifting revelation in me, but I’d be lying if I said I’m not moved by the ending. The music soars as freely and exultingly as your wandering avatar. You take flight with the aid and mutual joy of dozens of the cloth creatures that have been aiding you thus far. Instead of sand and ruins and dark corridors and icy, hail-scarred mountainsides, you fly through clear, bright blue sky, gold-brown ribbon-creatures leading you forward. I don’t think of myself as a very sentimental person, but I teared up at this point in both my play-throughs. The end of the game sees you returned to your spot in the night sky, a star shooting up, now a vessel for the cautionary history of the aggression that ripped apart this terrestrial society. After hearing that, I’m compelled to read Journey as a meditation settling somewhere between my first and second instincts. I’ve always thought of myself as a displaced person, a perennial outsider to my friends and loved ones. Large-scale mechanized violence didn’t make me rootless, but it definitely uprooted me — much like that hooded wanderer in the desert, with all their predecessors buried in the sands. That uprooted wanderer does experience a kind of adulated communion — something certainly approaching love, or at least care — with others like them, and with the world writ large. War and the instruments thereof threaten to further isolate, cripple, and erase them. But they need not do their job for them. Like the stranger I met in my first play-through, they can thwart isolation and huddle with others in the cold, so that they might do something somewhere between finding home and going there. Perhaps all that’s needed to communicate love, care, and community is the willingness to be there, no matter what heat, cold, or monsters have conspired to prevent you. Families are not so easily ruined as buildings. I’m going to visit my extended family in the former Yugoslavia this summer. I’ll certainly try to learn some Serbian beyond cuss words and food names, but perhaps what matters much more is just that I’ll be there. Whether I sing euphoniously, speak, write, or simply sit still, maybe that’ll be enough for my family to know I love them. Petar Duric’s writing interests are in radical social/cultural critique. He tweets @The_Slavsquatch about politics and cute animals.